Columba was born in Ireland around 521, and as a young man studied at the monastic school at the renowned Clonard Abbey in modern County Meath. Tradition asserts that some time around 560, Columba quarreled with his teacher, Saint Finnian over a psalter. 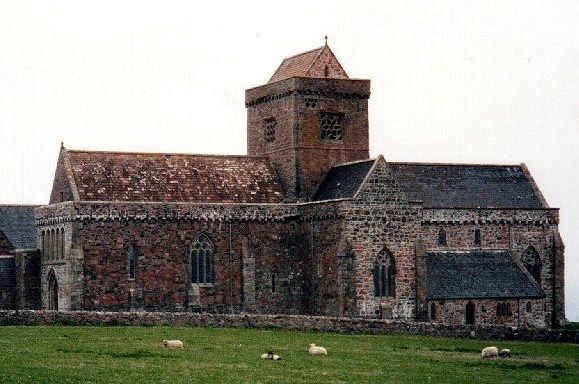 After several men were killed in the culminating battle, Columba exiled himself to Scotland, intending to convert the Picts and Scots as penance. 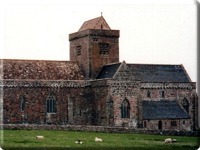 Columba arrived at the southern tip of the Kintyre peninsula in 563 with twelve companions and founded a Benedictine monastery on the island of Iona in the Inner Hebrides. From there, they began their evangelization mission, spreading Christianity through Scotland and northern England. (Legend tells us that Columba won many converts after subduing the infamous Loch Ness Monster!) 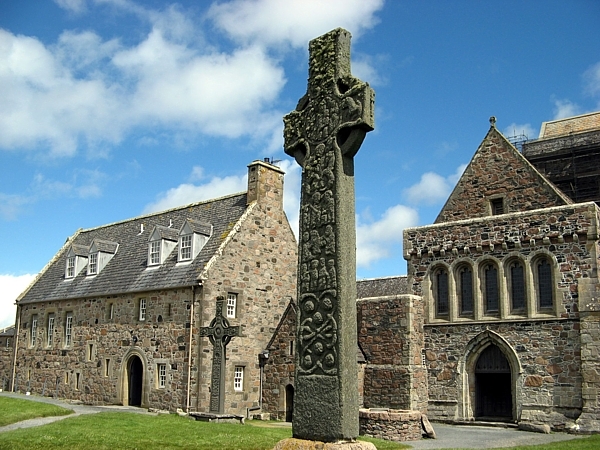 As the region's first centre of literacy, Iona Abbey filled with the sons of the ruling classes as leaders sent their heirs to Columba for education. Some local rulers were resistant at first, such as Bridei, a Pictish king based in Inverness. 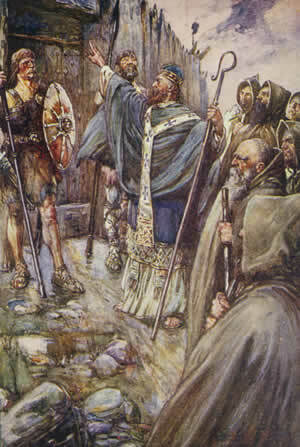 He refused to grant Columba and his party an audience and ordered his soldiers to bolt the castle gates. But as Columba stood before the closed doors and made the Sign of the Cross, the doors opened of their own accord. Columba, having converted the king, was then allowed to baptize the people of the kingdom. Bridei adopted Columba as an advisor and diplomat, and the saint subsequently came to play a major role in the region's politics. 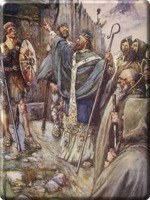 In this capacity he evangelized throughout the whole of Scotland, revitalizing a Celtic monastic tradition that had almost been lost in western Europe after the fall of the Roman Empire. 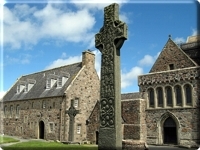 Iona Abbey, as the centre of Christianity in Scotland, attracted scholars from places as far as Scandinavia and France. Kings from Ireland, France, and Norway were buried beneath its grounds, as were the first Kings of Scots.